Twelve English High Streets - from Cornwall to Northumberland - will share a £1.2m pot of government cash to rejuvenate shopping areas. "Town teams" in areas including Liskeard and Newbiggin-by-the-Sea will try out ideas proposed by retail guru Mary Portas in her High Street review. Portas, who will make a TV programme about the 12, said she was "deeply touched" by the "creativity" of bids. Fifteen more "Portas pilot" areas will be selected later this year. "It is now clearer to me than ever that Britain wants its town centres revitalised and the energy and accountability for that needs to rest with the people who live and do business there," Portas said. Minister of State for Communities and Local Government Grant Shapps, meanwhile, said the competition had "captured the imagination of the nation with communities across the country uniting to support their High Streets". He said "the winners are going to get the focus and attention from Mary Portas herself and from me as the government minister". Portas - star of TV shows such as Mary Queen of Shops - would meet all the winning bidders and, along with his department, offer advice, Mr Shapps added. 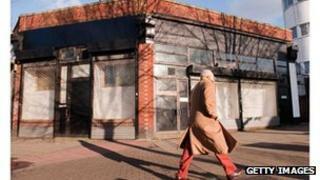 He said the High Street must work hard to compete with out-of-town shopping centres and the internet. "To make towns work, they're going to have to offer something different and interesting, something that the internet can't provide. "That's obviously human contact - a place to go and meet, a place where there are other interesting activities other than just shopping." Michael Weedon, deputy chief executive of the British Independent Retailers Association, said there was much work to be done. "This is money being given to twelve out of 371 towns that applied to it, this is not going to be a magic bullet for solving this and we must remember that it's a pilot. "This is about trying something out to achieve something and you have to be positive about this. They have to approach it positively to try and make a change." Media captionGrant Shapps: "Winners will be asked to help others"
Bedford, in Bedfordshire, Croydon, in London, and Bedminster, in Bristol, as well as Dartford and Margate - both in Kent - were also among successful towns chosen from more than 370 applications. Market Rasen, in Lincolnshire, Nelson, in Lancashire, Stockport, in Greater Manchester, Stockton-on-Tees, in County Durham, and Wolverhampton, in the West Midlands, have also been selected. The introduction of a young person's cafe, sports activities and an art and vintage market in Nelson as well as a "school for shopkeepers" in Dartford are among examples of how different towns aim to put money to use. Were town centres better before? A provincial High Street in the 1970s was a recognisable, easily navigable space. Having greater choice has taken us out of that comfort zone. It's like growing up and having to cook for yourself instead of having your mum put a plate of fish fingers and a bowl of Angel Delight in front of you every evening. The Wolverhampton town team will stage a Dragons' Den-style competition for local entrepreneurs while a creative arts complex, outdoor screening and new parking strategy are planned for Stockport. The successful towns will also receive support and advice from Ms Portas and other retail experts. The deadline for the next round of pilot applications from town teams - made up of councillors, landlords, business owners and MPs - is 30 June. They included making parking more affordable and disincentives for landlords who left shops empty.